A Beautiful Mind is a 2001 biographical drama film directed by Ron Howard. Based on the life of economist and mathematician John Forbes Nash Jr, the film was largely inspired by the bestselling unauthorized biography of the same name. This book, which won the National Book Critics Circle Award for a biography when it was published in 1998, was written by the journalist professor Sylvia Nasar, who her self has a Masters degree in economics and used to be an economic correspondent for the New York Times in the 1990s. 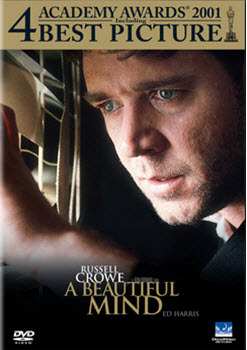 The film, which used a screenplay by Akiva Goldsman, starred Russel Crowe as John Nash and Jennifer Connelly as his wife, the Salvadoran-American physicist Alicia Nash (née Lardé Lopez-Harrison). Unlike the book, the film skips Nash’s childhood and instead starts with his days as a graduate student at Princeton University. Made on a $58 million budget, the film went to gross over $313 million worldwide and won four Academy Awards: Best Picture, Best Director, Best Adapted Screenplay and Best Supporting Actress. It was also nominated for Best Actor, Best Film Editing, Best Makeup, and Best Original Score. The film was generally well received by critics but caught some flack for leaving out certain notable aspects of Nash’s life, such as the son he fathered prior to his marriage. The discussion of the Nash equilibrium has also been criticized as over-simplified. During the five-day weekend of its limited United States release (21 December 2001), A Beautiful Mind opened at the #12 spot at the box office. Following its wider release on 4 January the following year, the movie peaked at the #2 spot. Box office $313,542,341 worldwide, of which $170,742,341 pertained to the United States and Canada. Home media Released on VHS and DVD in the United States on 25 June 2002. Released on Blu-ray in North America on 25 January 2011. The film starts with a young John Nash (played by Russell Crowe) arriving to Princeton University in 1947. Together with Martin Hansen (Josh Lucas), he has been awarded the prestigious Carnegie Scholarship for mathematics. At a reception, he meets a group of other talented graduate students: Richard Sol (Adam Goldberg), Bender (Anthony Rapp) and Ainsley Neilson (Jason Gray-Stanford). We are also introduced to his roommate, the literature student Charles Herman (Paul Bettany). At Princeton, Nash is under strong pressure to publish, but he doesn’t want to publish anything that isn’t his own original idea. In a key scene, we get to see Nash in a bar where he and some of his fellow graduate students debate the best way of approaching a group of women there. Hansen suggests an “every man for himself” approach, relying on theories from the 18th-century economist Adam Smith. Nash, on the other hand, claims that a cooperative approach would increase their chance of success. This gives him the idea for a new concept of governing dynamics – which eventually leads him to write an article that gets published. Nash’s article on governing dynamics is well received, and he is eventually offered an appointment at MIT, which he accepts. Sol and Bender also join MIT. After several years at MIT, Nash has grown displeased with his job there and finds his daily tasks boring and unworthy for a man of his talents. He is therefore delighted when the Pentagon asks for his help cracking encrypted enemy telecommunication. After successfully deciphering the code, he is given new assignments by William Parcher (Ed Harris) of the U.S. Department of Defense. The department wants him to look for patterns in newspapers and magazines that might be related to a Soviet plot. To keep the mission secret, he must deliver his findings to a secret mailbox instead of sending them directly to the Pentagon. Around the same time as his encounter with Parcher, an MIT student named Alicia Lardé (Jennifer Connelly) asks Nash out and the two forms a romantic relationship. Eventually, Nash proposes to Larde, after paying a visit to Princeton where he receives encouragement from his former roommate Herman and gets introduced to Herman’s niece Marcee (Vivien Cardone). Lardé accepts the proposal, and the two marry. Nash becomes increasingly focused on his work for the Pentagon, but the situation also scares him since he is acutely aware of the risk of Soviet agents trying to interfere. He feels followed and spied on when visiting the secret mailbox, and he begins to fear for his life in earnest after witnessing a violent altercation between Parcher and enemy agents. Nash makes an attempt to resign, but Parcher blackmails him into continuing. The situation reaches its highpoint when Nash is visiting Harvard University to deliver a guest lecture. At Harvard, he spots Soviet agents, led by a man called Doctor Rosen (Christopher Plummer). Nash desperately attempts to avoid capture, and violently punches Dr. Rosen to get away, but to no avail. Nash is sedated and transported to a psychiatric facility. At the psychiatric hospital, we get to see Dr. Rosen explaining to Alicia Nash that her husband is suffering from paranoid schizophrenia, and that Parcher is only a figment of Nash’s own imagination. His alleged previous meeting with Herman and Marcee was also something that didn’t actually happen. Nash himself believes that the psychiatric hospital is a bluff, run by the Soviets, but Alicia begins investigating the situation and eventually confronts her husband with all the documents he delivered to the secret mailbox. They have remained where he left them, unopened. Under Dr. Rosen’s care, Nash is given insulin shock therapy and antipsychotic medication. He improves and is allowed to return home. The antipsychotic medication makes Nash tired and unresponsive, and he secretly stops taking it. Parcher returns, and Alicia eventually unveils that Nash is once again “doing assignments for the Pentagon”. Rushing back into their home, Alicia finds that Nash has not only left their baby alone and unsupervised – but the baby is in a bathtub that is gradually filling with water. After saving the baby, she confronts her husband who claims that his old roommate Charles Herman was watching the baby. The frightened Alicia calls Dr. Rosen to get help, but Nash now believes that Parcher wants to kill Alicia and attacks Parcher to protect her. This results in Nash knocking Alicia – who is holding the baby – to the ground. Alicia gets in her car and tries to drive away with the baby, but Nash jumps in front of the car, pleading with her to stay. He says that he now understands that Parcher and several other figures are just hallucinations. Yet, Nash refuses to start taking his antipsychotic medication again, since he believes that the can deal with the symptoms without the help of medicine. Alicia decides to stay with him. Nash goes back to Princeton where Hansen, now head of the mathematics department, gives him permission to work out of the library and audit some classes. By the late 1970s, he is allowed to teach again, after having become very good at identifying and ignoring his hallucinations. In 1994, Nash is awarded the Sveriges Riksbank Prize in Economic Sciences in Memory of Alfred Nobel, a prize commonly known as the Nobel Memorial Prize in Economics. The movie ends with a scene in Stockholm, where Nash leaves the auditorium together with his wife and son. As he walks on, he sees Parcher, Herman, and Marcee just standing there, watching him attentively. There were rumors that Playtech was developing a slot machine based on the movie. Playtech had developed other popular slots based on movies including another Russel Crowe film, The Gladiator. The gladiator was a slot based on the film by the same name. The game features symbols based on the characters in the movie such as the Emperor, his sister, and the former gladiator turn game promoter. The game was fun to play and featured a special coliseum bonus game where you could win extra money, It was expected that the A beautiful mind slot machine would be similar to this and offer a bonus game based on Nashe’s delusions. This slot was never released and we have been unable to find any evidence that it was ever truly in developing. It seems like this might have been a baseless internet rumour based on many gamblers desire to see slot machines based on almost all movies.